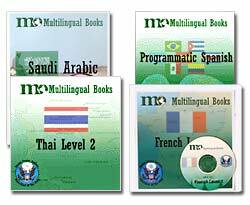 Multilingual Books now manufactures the entire line of Foreign Service Institute (FSI) courses, available in over 30 languages. These courses were developed for use by the U.S. Department of State and are considered by many to be the best and most complete language courses available. Some courses are now available on CD. Our exclusive CD versions have the quality and convenience of a CD along with the top-notch language teaching methods that the Foreign Service is famous for. Each new CD version has been carefully digitally remastered for greatly improved sound quality as compared to the commonly available cassette courses and is exclusive to Multilingual Books. For more FSI audio samples, visit our FSI page. Pimsleur is the world famous audio-only language course, perfect for people who want to learn beginning through intermediate foreign language skills. Pimsleur offers a unique, comprehensive program in 30-minute segments on audio CDs. (CD not available for all courses.) Courses available for: Albanian, Arabic, Armenian, Chinese, Croatian, Czech, Danish, Dutch, English (ESL for Mandarin Chinese, French, Korean, Italian, Russian, or Spanish), French, German, Greek, Haitian Creole, Hebrew, Indonesian, Italian, Japanese, Korean, Lithuanian, Norwegian, Ojibwe, Polish, Portuguese, Romanian, Russian, Spanish, Swedish, Twi, Ukrainian, and Vietnamese. Musical Spanish integrates right and left brain learning techniques, helping you to remember the words and their meaning, and is great for children as well as adults. The package includes a book with 10 colorful, graphical chapters, a CD-ROM with interactive features, a Spanish-English dictionary and worksheets for teachers. With 4-5 major grammar points per song, it presents an easy exposure to patterns which helps build fluency naturally, and provides a unique opportunity to practice pronunciation while learning. You don't need to know Spanish to use Musical Spanish as a teaching tool! With 112 page book, music CD, and Windows/Mac CD-ROM. Our finest Spanish course! ¡Habla!® offers you a unique, comprehensive program on eight 90 minute videos, 15 audio cassettes, 4 workbooks, and the Larousse bilingual dictionary. Produced in conjunction with Mexico's premier language school, ¡Habla!®'s approach is as close as you can come to an in-country total immersion course. Your teachers are expert native Spanish speakers, not American professors! You will not find this variety, quality, and quantity of materials anywhere else. An excellent value on a complete Spanish language lab. Preview of the ¡Habla!® method.